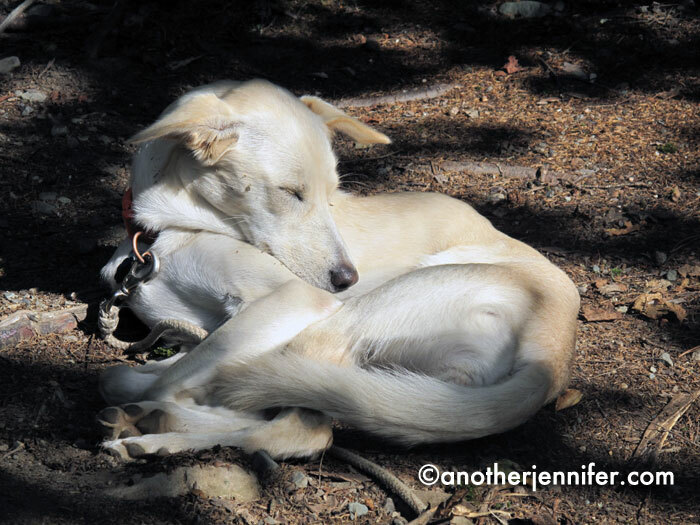 For today’s Wordless Wednesday, I’m sharing more Downeast Maine photos from my recent camping trip. There’s always something interesting to see when you visit Downeast Maine! This photo, taken on our way home at Lamoine State Park, was popular on Facebook. 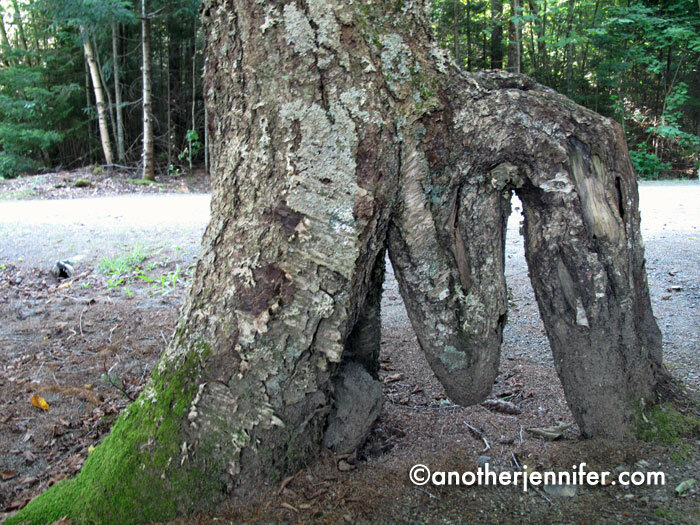 Our campsite had a tree in the shape of an M, for Mom. 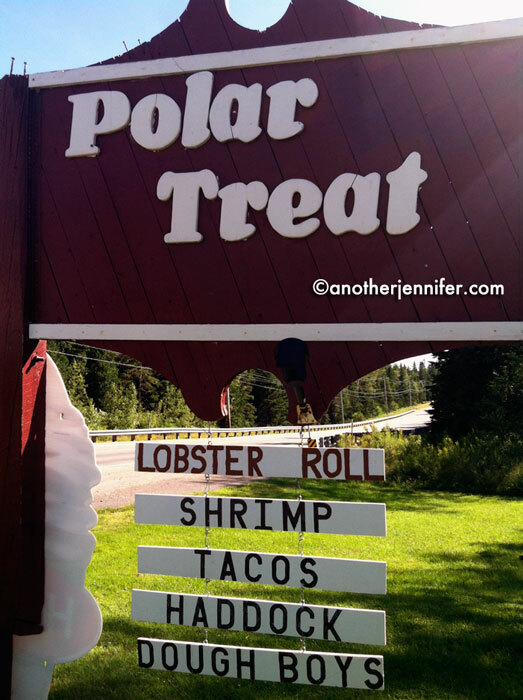 The Polar Treat, in Perry, had a unique menu. Not the sign you want to see at the beginning of a trail. I’m going to go with not worth the gamble. Does the head form in the window freak you out too? Do you see the heart shape in the fire? Our “private beach” at our campsite. I love that there was a tree named for you! And the heart in the fire! I think that head in the window would have freaked me out too. Shouldn’t there be a law against that? The head was weird. And the thing is that it was just the back of a building. Even more eery! That one with the head in the window? 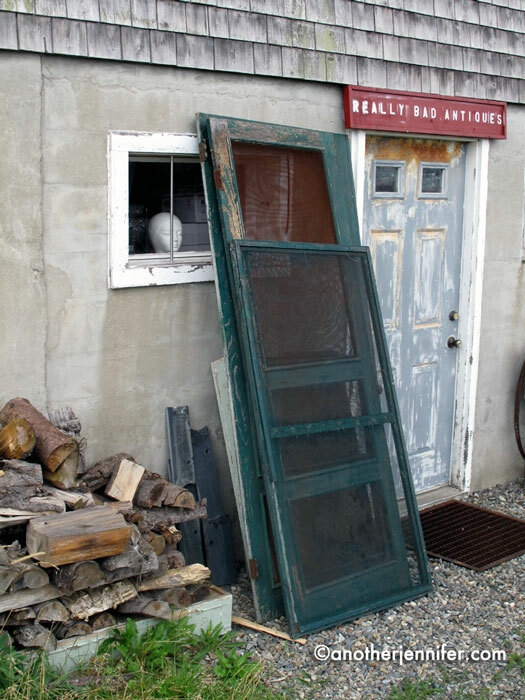 The name of the store there cracks me up: “Really Bad Antiques” haha. Great photos! It looks like you had a great time while down there. One of these days maybe I’ll have time to get back on the bandwagon…though with teaching and graduate courses, yikes, haha. You know what’s funny about that sign? I don’t think it’s a real store. It’s actually the back of a building. I don’t remember a store by that name in the front. Makes it even more weird, doesn’t it? Good to “see” you too, Cyndi! Great photos! Love the Mom tree! 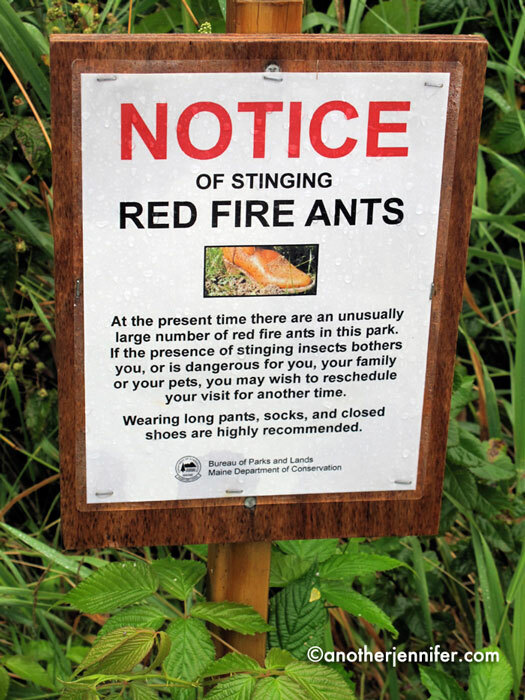 And no I would not want to see any fire ants!! And we actually did walk down to the beach through fire ants. We thought by skipping the woods we’d be okay. Apparently not. Luckily (sort of) it was cold and rainy so we were protected. We found a different path back up that led us away from the ants and we did a quick check before getting into the car to get rid of stragglers on our shoes. It was an adventure! thedoseofreality recently posted..Would You Rather: Go 2 Weeks With No Access To An Iron Or A Blow Dryer? My husband and I thought the tacos were an interesting addition to the Polar Treat menu. I was pretty excited about the heart too! Thanks, Michelle! We had a ball on our trip. Yes, I see the heart in the fire and the “M” in the tree! I see the head in the window too, but I’m pretending I don’t. Yup. 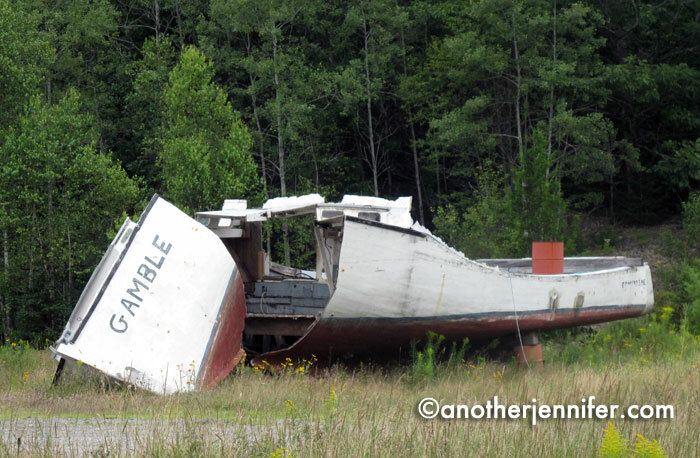 And irony about the boat named “Gamble” being a bad gamble. 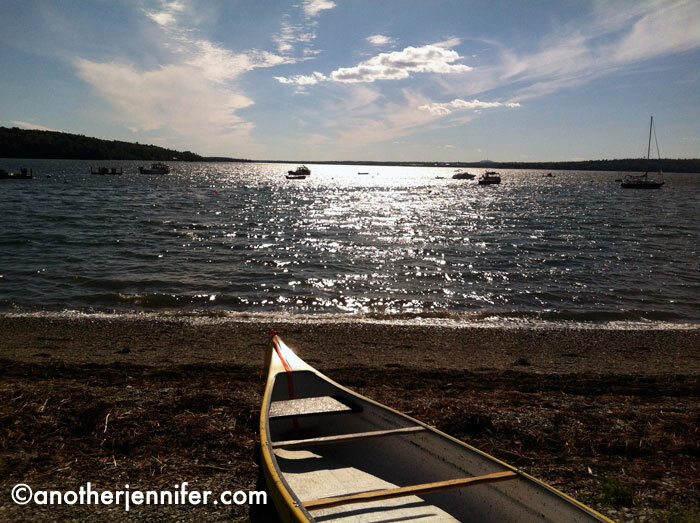 You’re killing me here – three more weeks of summer and all I want to do is go to Maine. I’m getting much worse about the end of summer as I get older. I think it’s from having kids. Tamara recently posted..Head and Heart Places. I would have ordered everything on that menu! I love the heart in the fire- – it was sending you a message! I would love a menu like that!! The menu seems to be a big hit. They also had ice cream topped with treats for our dogs! 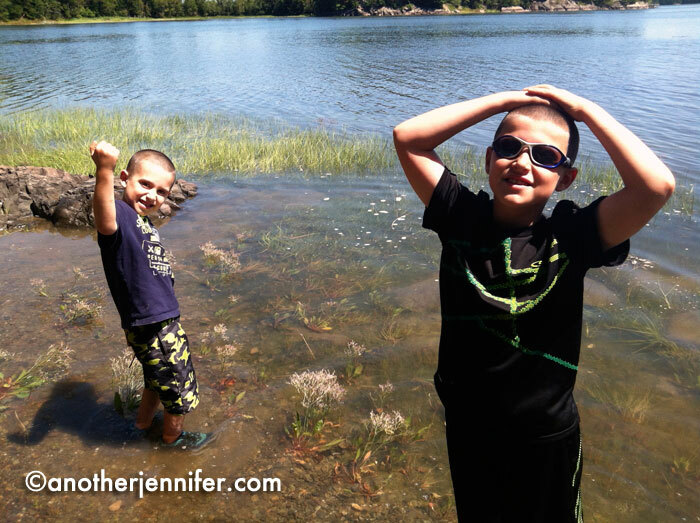 Great photo’s jen… the kids are getting Soooo big! I know, Jen! I wish I could slow it down! I’m still looking at the menu, and dreaming. I’m sure the other photos are nice too. Maybe you should write a post about the … food. Ha! 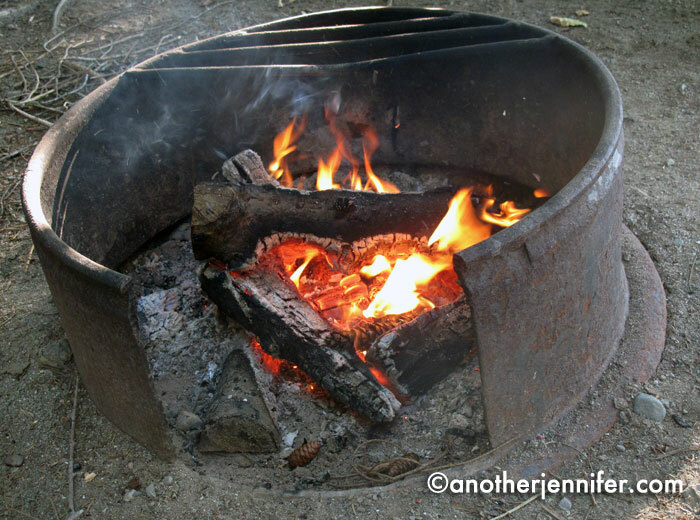 I thought about writing a post about our camping food. My husband and son did a spectacular job with the menu. Note: “Blog” and “Menu” are always good partners. I loveee the M tree!